By entering the www.magyarermebolt.hu web site, you agree to the following terms and conditions, even if youre not a registered user or subscriber of any service of the system. refer to the Terms and Conditions (GTC) only in Hungary Coin Shop (EuroFull Bt) (hereinafter: Company) www.magyarermebolt.hu website (website below). Please note, if you want to buy in the web shop, read in its entirety on the website regular sessions, use and content of legislation, in this case, take advantage of our services, if it agrees with every point and admitted self-binding. The contract to be concluded by (Customer and the Company (the case is not automatic confirmation) confirmation of a contract in writing, the resulting contract with the company manages its own database and invoice records. The GCC was the case in Hungarian, German and English, discussion of interpretation, written in the Hungarian language GTC shall prevail. Please note that the code of conduct for activities in the service of the Company does not have. The webshop issued by the Bank, at nominal value of the asset and market involvement of legal tender qualifying as gold, silver, precious metal commemorative coins, bank notes and sample banknotes in circulation and withdrawn from circulation and other fittings, traffic queues with traffic coins, foreign gold, silver, precious metal coins, and custom-made gold banknote copies available, can be purchased. The purchaser of the product ordered in person or by bank transfer (to our bank cash deposits), postal delivery, by courier delivery, cash on delivery can take over. Order, purchase can do so in the web shop, the performance of the confirmed orders within each feed modes detailed deadlines. The shop operation, ordering, purchasing and delivery terms in case of any issues raised by the Company in the specified availabilities with the customers disposal. Headquarters: 1131 Budapest, St. László út 101-103. Licensing authority: Hungarian Trade Licensing Office Hungary Bp. 1089 Bláthy Ottó u. 3-5. Hosting Provider Company: Inelton Kft. Web hosting provider office: 1192 Budapest Botond u. 9. The site is made of the same coin collectors, commemorative coins, coins for those interested to let you easily scanned commemorative coins and the total of HUF system from the beginning to the present, thereby acquiring collections information on possible missing from pieces that are in the coin shop side even to buy. 1) "Information about the money," or "coin shop" Entering menu you can view our products. the.) "Categories" , you can be found by product group (first day mountings, lines ...... etc) of our products. After selecting the appropriate product group for the different product groups are categorized (eg . : year, etc), this can accede to view our products. Click on the name of the product you detailed parameters description of the image to view the selected product. b.) "Search by material , you can view gold and silver products. c.) "nominal value" products can be narrowed , you are looking for the face value of the product selection. d.) "Quick Search" , you can narrow your search by entering the desired product ..
valid order can deliver after your registration. The site is located in the upper right side of "Personal Settings" menu by clicking on the incoming side, I am a new customer, you can click "Next" comes in the registration page, which obviously need to be filled. Registered users click on the "Personal Settings" menu, you can enter after the e-mail address and a password. After admission to buy the right product to cart to take with you if you want to buy more products, then the left-hand menu reason you can always choose the right product, and then placed in basket. If all the products that you want to buy a cart placed, you can click on the right side on top "Shopping cart" menu you can view all piled into product, modify, delete, or you can change the unit of quantity. Then, by clicking in the bottom right corner "Withdraw" icon to move to the "Shipping Information" page. you can set menu during the delivery address, or you can change your name, shipping address. During the transport mode menu you can select the shipping method. Comments on the comments section, your message might describe. Click on the right-hand bottom corner "more" icon to move to where the payment method can be used. Click on the right-hand bottom corner "more" icon in order to be able to view summary for which the previously entered data may still be modified. If all information is correct, in the lower right corner "order is completed" by clicking on the icon you can deliver your order. Then, during the offer process to get more information about ordering. The offer of e-mail immediately receive an automatic e-mail sent in the order shown. Please note, this email does not constitute a contractual, any false information of any kind of material, legal and moral responsibility is not borne by the company. within 3 (three) business days after the order confirmed in writing to the Company (Customer registered e-mail address) in the order. If the product is available, depending on the chosen mode of acceptance, all information for the Customer, in particular the receipt, payment periods. If the product is not available to the Company, shall inform in writing the Customer (Customer registered e-mail address), in which case the company any kind of material, legal and moral responsibility is not borne by the Client does not enforce. Under the menu item in the new and old Numismatic You can view our news. The site partners and more important, reliable link collections can be found. The currency of payment method of payment in accordance with the prevailing legal service points (Hungary), currently HUF (Hungarian Forint). 1.Cash The value of goods ordered on receipt of the Customer can pay Up to 299,000 HUF in cash (Hungarian Forint), except for the NEW Customer, who can only pay the purchase price of the product by wire transfer at the first purchase. From 299.001 HUF you can receive a personal receipt beforehand. second Bank account transfer The value of the goods ordered in all cases be able to fulfill our bank account transfer (Hungarian Forint) prior to delivery. The reference to the case of foreign bank accounts in the respective currency exchange (currency-Hungarian forints) cash credit costs will be charged. via postal service or courier service to ship COD 3 The value of goods ordered for packing and shipping costs COD delivery to the post office staff, courier employees Up to 299,000 HUF in cash payable upon receipt of the package. 1. If the prices are for one -db webshop prices for products and domestic and intra-EU shipping address gross prices. Net exports rates for shipping address is outside the EU. 2. Prices do not contain handling and transportation costs. 3. the right to change the Companys reserves. The pre-orders price changes, the price change does not apply. 4. If the wrong price in the web surface (eg . : well-known, accepted or estimated price of the products at significantly different (30%), or a system error messages are unrealistically low and high price, the Company is not obligated to order product at the price sell. in writing (Customer registered e-mail address) within 5 (five) working days after the Customer about the receipt of the order, which shall terminate the contract. in case of wrong price for the company of any kind of material, legal and moral responsibility is not borne by the Client does not enforceable. Syndicate 1. Personally The value of the goods ordered Customer can pay Up to 299.000 HUF cash at the takeover. From 299.001 HUF you can receive a personal receipt beforehand, except for the NEW Customer, who can only pay the purchase price of the product by wire transfer at the first purchase. In case of personal acceptance of the Company after the completion complaints are not accepted. 2 via postal service or courier delivery The value of the goods ordered be able to fulfill our bank account transfer or cash payment prior to delivery. Then, postal employee, or the employee of a courier delivered a package Buyer, write. Checked every letter, every package of Company assume financial responsibility only for "ÉRTÉKBIZTOSITOTT" package. via postal service or courier service to ship COD 3 and if the value of the packaging and delivery charge cash on delivery to the post office staff, courier employees Up to 299.000 HUF in cash payable upon receipt of the package of the goods ordered. Or sent by postal mail or courier service for packet Customer is entitled to the letter visibly damaged packages or luggage receipt of refusal in case of deficient performance observed in the consignment received notification of complaint. In both cases, the Client is obliged to make the notification within the Company for a maximum of two (2) working days. The announcement of the by telephone (0036-30-892-6871) or by email (info@magyarermebolt.hu). Written notification to the Company within 5 (five) working days subject to confirmation in writing (Customer registered e-mail address). The Company is required to investigate within 5 (five) working days of the legitimacy of the complaint, notified in writing by the Customer (Customer registered e-mail address). In case of a justified complaint, mainly in the Company missing goods free of charge to the Customer deliver, and secondly (if not the goods available), then the goods paid by the Customer + shipping & packing costs reimbursed within 5 (five) working days Client on the same terms as the payment was made. The above order does not affect the Customer to these Terms and Conditions as detailed in the contract cancellation / termination or warranty and guarantee rights. If the pre-transfer paid consignment or cash on delivery order shipment of performing delivery postal service or courier service "recipient unknown", "delivery is not possible," "moved", "acceptance refused" or the Purchaser will send back due to fault reasons the Company shall inform the Customer in writing (Customer registered e-mail address) or by phone. Cash on delivery mode of transport in case the Customer shall pay delivery costs, as well as the return shipping costs paid by the Company for 8 days. If the Customer delivery was at fault can not be met, the repeated delivery costs borne by the customer. In the case of repeated delivery repeated failure by the Company to pay to the order value of non-performance of 20% of the contract requires the Customer as a penalty. 1. The transport costs are at the bottom of the web page in the "Transportation and Guarantee" section are available separately. 2. The amount of the corresponding domestic delivery mode of transport costs in order to calculate the respective web for information. Foreign shipping costs will be calculated retrospectively, based on which Customer is entitled to cancel the agreement, if the shipping costs will not be accepted. 3. The shipping cost includes the cost of packaging and shipping as well. 4. The weight of the transport costs and limit values are linked. The cost of packaging, shipping costs are charged in addition to service providers and are based on the case of domestic and intra-EU shipping address gross prices, delivery address in case of non-EU net prices prevailing tariffs. 5. Changes in the tariffs of the Company reserves the right to modification. The amendment does not apply to previous orders. The Company prior to the conclusion of contracts subject to these Terms and Conditions Treaty, 2017. évi LIII." law on the prevention and prevention of money laundering and terrorist financing" (hereinafter referred to as the Act) carried out on the basis of customer identification. If the customer in addition to the person acting on behalf of the legal person or other organization, the clients identity, the Company will perform a legal person or other organization of its identification. d. If the Customer previously recorded data identifying the veracity or adequacy of doubt concerning. e. B. due diligence obligations specified in section covers actually interrelated, transaction orders with a combined value of up to 3.6 million forints. In this case, the due diligence to be carried out in the transaction order was adopted, by which the aggregate value of the transaction orders reaches HUF 3,600,000. A. For natural persons, a) Hungarian citizens to verify the identity suitable for official certificate (identity card, a new type of drivers license, passport) and official address card. The exception is the simplified mode identification, in which case the name, address, email address, phone number, that is, through the registration is done on the site. e) legal persons, entities without legal personality prior to the application for registration, the registration authority or court register for an application, authority or court of the legal entity or organization without legal personality of association (deed of foundation, statutes). is required to prove by evidence within 30 days of the Customer or the official court registration has taken place, it has taken place of incorporation or registration, as well as the service provider shall the company registration number or registration number recorded. C.For the purpose of verifying the identity of the Company, the Company shall provide a copy of the document presented with specific data to prevent and prevent the money laundering and the terrorist financing, to ensure the proper fulfillment of the obligations set forth in the Law, to fully implement the obligation of due diligence and to perform the supervision effectively create. 3. Validity The personal identification documents when checking performing required to check the validity of the document presented as identification. In case of an invalid deed of sale of the Company shall stay as long as the current document will be presented. 4. Change notice According to the data of the fixed point 2 Customer there is a change, the change of the Customer - is required to notify the company - within five days of its occurrence. 5. Identification not required You do not need to perform customer identification, the other identification is required if it has already carried out under the relevant legislation and to accept the results of the Company under the relevant laws and internal regulations. 6.Other The matters Customer due diligence obligations menu unregulated act in accordance with the Companys internal rules and according to the law, according to specified. In case of war, rebellion, acts of terrorism, strike or demonstration not governed as strike, import or export embargo, accident, fire, blockade, flood, natural disaster, severe energy supply disruption or other unforeseeable and unavoidable obstacle consequence of which the Purchaser or the Company It falls outside the scope of, one of them is unable to fulfill a contractual obligation, then this person (Customer, Company) shall not be liable for any loss or damage which came as a result of these events. The Company reserves all rights with regard to copying and distribution of any portion of this site by any method, technique. The content and design of pages of sheet protected by international and Hungarian laws The companys Web site, belonging to the satellite images, sound and text as well as their layout are copyright (collective work, etc ...) and the mark is protected. For those - in excess of the amount of personal use - use in any form only with the express prior written consent of the Company in this respect is possible. An exception www.magyarermebolt.hu partial (maximum of 5) use, transfer to third party websites or inserting marking and linking the source is, which is free and does not require a license. Failure to do so constitutes a breach of the source of the copyright! The statement LXXVI of 1999 on copyright. prohibition constitutes a declaration by paragraph § 36 of the Act (2). All infringements of copyright vested in the company ködbér by viewing the page www.magyarermebolt.hu, User, Customer, etc. taking note of. ködbér the amount determined by the Company in the amount of HUF 30,000 gross words per gross HUF 3,000 lump sum or as an image. The Inspector www.magyarermebolt.hu page, User, Customer, etc. acknowledges. that the amount of ködbér not exaggerated, www.magyarermebolt.hu this page browsing, accepts implicitly views. His customer comments published on its pages, User regarding the use of the website on comments, suggestions and ideas to the Company acquires unlimited and exclusive use rights. The Company any such law on the observations become the sole owner, and their use is not restricted in any way. The Company shall be entitled, without limitation, the client, utilization of users comments, use, reproduce, publish, adapt, publish, transmit and distribute to the public without the Buyer should therefore provide compensation in any way. 2. orders, purchase only registered users can initiate. The registration should be carried out only once, after check-in is possible after purchase without having to enter the data. Changing the data has been registered after the login web page as possible, or for info@magyarermebolt.hu e-mail request for amendment. 3. The web store purchases with a product in a basket with a maximum of two (2) pieces placed. Subject to additional restrictions on the amount of available reserves of the Company. 4. The Company in the web shop, the website of any other creatives tee-edge illustration or technical failures of any kind of material, moral rights shall not be liable, Customer can not enforceable. 5. The Company excludes all liability for any damages that arise due to the Customer on the web connectivity are unsuccessful. In case 6.new coin appearance (as the sole distributor may limit the amount to be disclosed), the Company reserves the right to limit the amount, so you may find that not all orders can be satisfied. The temporal sequence of the orders we received attention. In this case, the company any kind of material, legal and moral responsibility is not borne by the Client does not enforce. Order 45/2014. (II. 26.) The Government of "the detailed rules of contracts between consumers and businesses Regulation (hereinafter: Government Decree), § 20, as specified in the contract (14) may withdraw within fourteen days without giving a reason or terminate it. § 20 (1) In the case outside the premises and entered into an agreement concluded between the distance contract the consumer is entitled to a right of withdrawal without giving reasons within the period specified in paragraph (2). In addition to an off-premises contracts between bound and distance, which is to provide services if, after § 13 or statement under § 19 to take the performance begins, the consumer within the time limit specified in paragraph (2) for a right of termination without cause . In a contract for the provision b) the date of conclusion of the contract services It is exercised within fourteen days. in point a) (3), A (2) shall not affect the consumers right to withdrawal rights set out in this § exercised in the period between the conclusion of the contract date and the date of receipt of the product. To: Hungary Coin Shop / EuroFull Bt. Address:. 1131 Budapest, Szent László út 101-103. I, the undersigned, declare that I practice as defined by the law of withdrawal / cancellation my right following the sale of (please provide a detailed description of the product purchased by sending its enforceable. b) a clear statement by the relevant exercise. (2) The company also provides web site may exercise (1) of the right provided for in § 20 of the consumer. In this case, the firm durable medium immediately acknowledge receipt of the declaration of the consumer. (3) The law specified in § 20 shall be considered to be validated in time when a consumer statement sent before the deadline in § 20 (2) and specified in § 21. (4) The consumer bears the burden of proving that the law specified in § 20. § exercised in accordance with this scarf. 2. In case of termination / cancellation of the consideration paid by the customer (product (s) value, packaging and delivery costs), the Company no later than 14 (fourteen) days after the withdrawal can report receipt of the product (s) original, complete condition, after the necessary appurtenances (eg . : a certificate of authenticity, plastic capsules, ... .. etc.) returned to the Customer repays, the same payment method used for the purchase of way. The Company may withhold a refund as long as the products were not returned. If the Customer withdrawal / termination of the product itself, the Company is obliged to return at his own expense within 14 days of cancellation / termination is notified. The Customer other costs not charged, but the depreciation resulting from the use of excess use for the product, the nature, characteristics and functioning of determining meet. 3. Customer may not exercise the right of withdrawal orders, for products manufactured exclusively for under the instructions. You can send e-mail (info@magyarermebolt.hu) or by registered mail (Hungarian coin shop / Euro Full Bt. 1131 Budapest, St. László. u. 101-103.) a written statement of withdrawal 4. Customer validation / right to terminate the online ordering a. in case of exercise of withdrawal / termination right e-mail sent to the company within 5 (five) days in writing (e-mail address registered Customer) statement confirms the Order to that effect. 5. The list after the deadline specified cancellation / termination, the Company will not be accepted. against the company supplies warranty needs as specified in the Civil Code of the Customer enforceable. The law may require repair or replacement of the product unless it is chosen by the Customer demand can not be met or the company would lead to disproportionate additional costs compared with other requirements to fulfill. If the repair or replacement of the Customer has not requested or sought, they ask price of the goods are delivered or the fault of the Company at the expense of the Customer itself is correct and corrected or, ultimately, the contract also withdraw from others, too. Choosing the right Customer supplies warranty also revert to another, the cost of converting the Customer shall bear unless it was necessary, or to have been attributable to the Company from. The Customer shall the error immediately, but within a maximum of two months as from the date of discovery of the defect notified after discovery. If a new product is a two-year limitation period from the date of completion of the contract is too supplies warranty rights of the Customer or not enforce product is used for a year. The Customer can against the Company, supplies warranty validate his claim. Customer demand for the enforcement of supplies warranty no later than six months from the date of fulfillment of the error disclosure of other strings attached too, if the Customer certifies that the product was purchased from the company. However, after six months has elapsed from the date of fulfillment of the Customer must prove that the fault had been identified by the Customer at the time of the performance as well. The product is the fault of the Customer supplies warranty law or product liability claim to assert their choice. Product liability in case of need Customer may only repair or replacement for defective products. A product is defective when it does not meet quality standards or force when released, if it has no parameters in the properties by the Company herein. Of product the customer needs the product in respect of enforced within two years from the date of the sale by the Company. After this deadline, Customer will lose this right. Product liability claim may only be exercised against the sale of goods manufacturer or dealer. If the flaws of product needs to prove to the Customer. failure of the product resulting from legislation or binding official regulations implementing it. The company has a sufficient reason for the exemption is to prove. The error due to a Customer supplies warranty of product demand and at the same time, in parallel is not enforceable. However, for the effective enforcement of product demand supplies warranty demand for the product replaced or repaired parts may enforce against the manufacturer. marketed by the companys product - coins, medals, gift boxes, banknotes, banknote pattern, traffic lines, etc .... - Do not fall under the statutory warranty products include single. Volunteer guarantee the Company shall not. 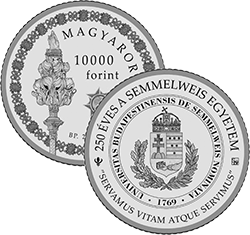 supplies warranty / Customer in writing in the form of product demand info@magyarermebolt.hu e-mail or by registered letter with acknowledgment of receipt (Hungarian coin shop / EuroFull Bt. 1131 Budapest, St. László. U. 101-103) sent validate e-mail sent to the companys request 5 ( ie five) days written (Customer registered e-mail address) confirms the statement by the Customer in this respect. The request will be dealt with on the basis of complaint handling Regulations of the Company, which is read during the handling of complaints. Customer complaints and e-mail notification to the Company within 5 (five) days after confirming in writing (e-mail address registered customer). A) a verbal complaint: By telephone at the telephone number 0036-30-892-6871 complaint filing. B) Written complaints. Via e-mail sent to the e-mail address info@magyarermebolt.hu written complaint -POSTAL Way the Hungarian coin shop / Eurofull Bt.1131 in Budapest. St. László út 101-103 complaint sent by registered letter sent. The complainant also may act by proxy. If the complainant is acting by proxy, the proxy must be in a public deed or a private document with full probative force.
.) investigating the complaint, free of charge. C). The incoming complaints should be provided with a unique identification serial number should be recorded. D.) at the sales invoice issued by the Company or receipt confirming the conclusion of the contract. E.) The warranty claims of the Customer when validating invoice or receipt must have the desire and the report must be presented upon. F.) The announcement of Customer warranty claims must always be recorded in writing. G) in your phone. - Complaints should be promptly investigated and remedied as possible. If a complaint is not immediately possible, the Company shall make a record. If the Customer handling of verbal complaint does not agree with the complaint and the Companys position in a related report. The Protocol and the answer given to the Customer complaints should be sent a copy of the case of a verbal complaint reported by telephone, a written complaint. In this case, the specific complaint, a reasoned reply should be sent within 30 calendar days of the notification. I). If the Complainant warranty requirements can be met details of the announcement, the Company can not comment on the position to be verifiable way communicated to the complainant, together with the event of rejection with justification, within 5 (five) working days. In case of refusal, the complainant should also be informed that an investigation into the complaint is rejected may request arbitration authority or body. J.) If the Complainant warranty claim the Company intends to settle the disputed correcting or replacing the product, they must strive to make the repair or replacement is completed within a maximum of fifteen (15) working days.
) The complaint protocol. - Report all warranty claims for all other complaints - the copy of the complaint and the response was required to keep for three years the Company. L.) Notification of warranty claim does not constitute a complaint under the law on consumer protection. M) The Companys webshop ordered or purchased goods trade rules for distance -. (.. 45/2014 (II.26) government regulation - and the Sun Act 2013 shall prevail, that prevailing terms and conditions published on the website of the Company are detailed in the contract. of investigating complaints and other data needed to answer. B.) Customer lodging the complaint senior official data of 2011 on Informational Self-Determination and Freedom of Information Law. It must be treated in accordance with the provisions of the Act. B.) of 30 calendar days to respond statutory time-limit for rejection of the complaint or the investigation of the complaint is unsuccessful this time, the consumer does not qualify as Customer may go to court. B.) The complaint and the response must be kept for three years. The Company Privacy Information described under "Privacy Notice" section. The Company seeks primarily to amicably settle any disputes that may arise with the Customer. The online dispute resolution platform can be used to finance consumer disputes. If not successful, the relevant provisions of, and any disputes in the Company of the Pest Central District Court (Marko V. u. 25) stipulates jurisdiction. present Terms and Conditions shall enter into force upon online publication and is valid until withdrawn. the text of the "Terms and Conditions" will be published in the web. XLVII of 2008 on the prohibition of unfair commercial practices against consumers. Act (UCPA). -the mandatory for certain guarantees for consumer durables 151/2003. Regulation (IX. 22.). selling price and unit price, and 4/2009 on detailed rules for the service fee indication of its products. (I, 30) NFGM-SZMM Joint Decree. The legislation relied http://net.jogtar.hu/ available link.